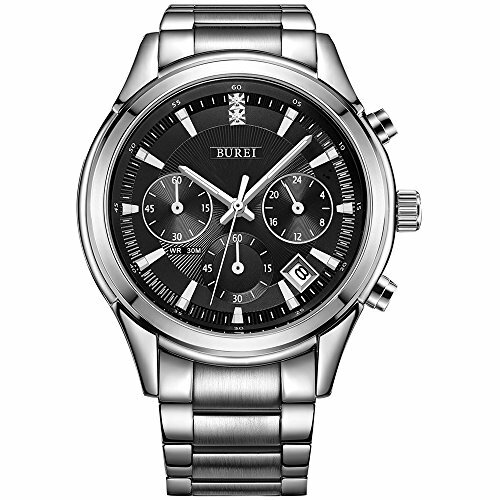 BUREI WATCH, It focuses on high quality & reasonable price on the market. Every single watch is a unique label of BUREI.The goal of BUREI is to make every watch a work of art. 24 months maintenance for quality issues. 1.Scratch-resistant Mineral Crystal Lens; Round stainless steel case. High-quality materials protect precise Time Module movement keeping good time. chronograph function, 24 hour read-out and chronograph timer. 2.Durable Stainless steel bracelet with fold over safety clasp, date calendar, suitable for your daily wear . Watches links remover tool is bonus so you can adjust the bracelet easily by yourself at home; Water resistant to 30 meters (99ft), however we do not recommend swimming or taking showers with the watch on. 3.Our advantages: Buying a BUREI watch, means you are assured of receiving an extremely high quality watch at a reasonable price. This men's simple, luxury, and classical design wrist watch will be perfect for every occasion. This watch also comes available in a ladies version. 4.You will receive a gorgeous watch, completed with branded BUREI box, gift bag and Watch Link Remover. This extremely high quality watch is the perfect gift for your family or friends. SIZE: -Case Diameter: 40.9mm; Net weight: 154 Grams -Band Length:183 mm; Band Width: 20mm. 5.Customer Service:30-day money-back guarantee for any reason; 12-month warranty for quality-related issues; 24-months maintenance for quality issues. If you have any questions, please email our after-sale team who will to help you to solve your problem the first time.